A pen flashlight is perhaps an underappreciated addition to any household, camping trip or work environment. You might think that they are just flashlights, but you’d be wrong. Penlights are compact, convenient and most (especially the ones on this list) are packed full of extra features that you never thought you’d need in a flashlight. If you’ve never owned a penlight before, there is a chance you are missing out on something, but how do you choose which is the most awesome pen light for you? Have no fear, our dudes, we’ve compiled a list of the best pen lights to get you out of the dark and shine a light on the coolest, brightest and most effective pen lights that you can get your hands on. The Streamlight 66133 is our top choice for the best penlight and brings a high quality feel that would be perfectly suitable for both professional and every day environments. It comes at a great price, but there is nothing cheap about it, still providing excellent brightness that can survive years worth of use. Its durability is a massively attractive feature, but it also comes with convenience to be utilized quickly and efficiently as well as having a long run time to be invaluable when camping or during power-outages. It is also a rechargeable flashlight, so can be relied on even when there is not a battery in sight. This rechargeable LED flashlight has been selected as our Premium Choice when considering the best pen lights. The beam is strong and ultra-focused to allow for unparalleled use when inspecting sensitive electronics, patients, or simply searching in the back of the closet. The charge port is hidden to protect it from the elements and the outer casing is easy to grip as well as being hugely robust to withstand damage such as drops or being driven over. 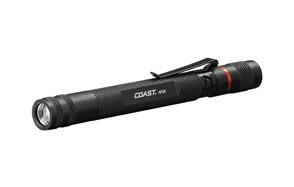 No matter what you might need it for, the Coast Focusing penlight is certainly the best pen flashlight that you can find, for all occasions. Don’t let the perhaps-too-Mr.-Spock name put you off, the Brite pen light is still an effective little device that is both slim and stylish as well as providing EPLI output that is perfect for all kinds of outdoor adventures. For its size, it offers impressive brightness, even though the whole light is only ever so slightly larger than a marker pen. The outer casing is durable and can be used every day for years without worrying about external damage. While the high runtime is merely 30 minutes, there are few occasions where you will need to use it for this long, so this shouldn’t be too much of an issue. Provided at an excellent and reasonable price, the 5.11 Tactical Pocket Penlight will be a great companion through years of work and recreational activities such as hunting and camping. The light can reach as far as forty meters and illuminates the area in a cone to ensure that you can see as much of what’s in front of you as possible. It is small enough to be stored in the front pocket of a shirt and can be secured with a clip to prevent it falling out and disappearing. The outer casing is strong and scratch-resistant which is able to survive drops of up to 3 meters. 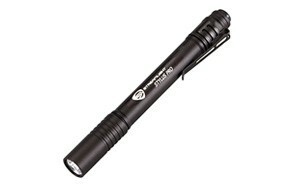 With this pen light, you will get a reliable light source that can withstand all sorts of knocks and drops. Be sure to check our tactical flashlights review for more great options like this. Our choice for the best value penlight is the Streamlight 66118 Stylus Pro that is sold with a high quality finish as well as a tear resistant holster to keep it safe in extreme environments. The push button switch is easy to operate and won’t get stuck, while the light is compact enough to be carried in shirt or jacket pockets without weighing you down. This compactness makes it ideal to carry around with you every day and use quickly and efficiently to replace using your phone camera. It has an excellent battery life, and has a durable outer casing to keep it operational come rain or snow. A massive improvement on the previous model, the Pelican 1920 LED pen flashlight brings an increased Lumen count (from 67 up to 120) despite only requiring one battery, while still providing a decent beam that can prove massively useful in any kind of situation. The flashlight is slightly bulky, but you will get used to this pretty quickly and is still compact enough to fit comfortably in your shirt pocket so it can be easily accessed when inspecting hard to see areas such as attic spaces, under cars, or behind TVs. For different situations, there are two kinds of output mode, so you won’t waste battery life if you do not need to. Topping out at a maximum of 500 Lumens, this is the brightest penlight on our list, and perhaps the brightest penlight you will ever find in your life (for now). 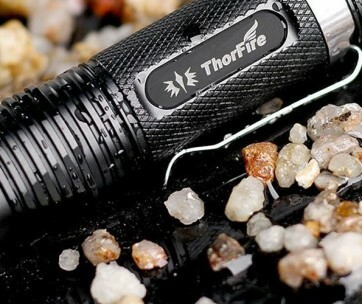 ThruNite Archer 2A is a high-end flashlight at an entry-level price, so even newbies can reap its benefits. It offers multiple modes that are easy to switch between depending on your needs, and is small enough to carry easily in pockets without taking up too much space. On lower settings, the battery life runs at an impressive 28 days, while higher settings will help to illuminate deep, dark areas of the world like it was the middle of the day. It also uses AA batteries, so you can be sure to easily find replacements when the battery does eventually run out. Love this product? Check out our review of the top EDC flashlights for our top picks. 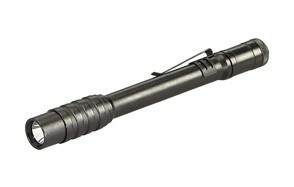 The Streamlight 88033 is a tactical / penlight combination that is built to last. It is perfect for military and law enforcement officials and has been designed with a push button tail switch to easily alter modes whenever you need. Furthermore, these modes are programmable to give you exactly what you need, whenever you need it. With all of its features, there is no excuse not to carry this light every day, and it can help you in a multitude of situations that you don’t even realize. Its casing is robust and durable and can survive being dropped and submerged, even for days at a time. Yeah, it looks more like a lightsaber handle than a flashlight, but doesn’t that make it cooler? The Fenix LD22 comes with a lifetime warranty, for your peace of mind, while also delivering in the functionality department, too. It works perfectly as a camping light or one to use when working on the car, but can also function ideally as something to have around the house. Also provided is an excellent runtime with decent output that won’t blind you, but will also not have you straining your eyes, either. Sturdy and well-built, Nite Ize brings both efficiency and style to the table with its Inova XP LED penlight. It has a powerful beam that offers a wide-spread and focused hotspot which means you’ll never be without light again. Additionally, its twist-switch technology makes it easy to operate, even if it takes some getting used to. The construction is tough enough to handle all kinds of abuse and still delivers excellent results after years of use while still looking stylish. Our handy guide to the self defence flashlights features more great products like this so check it out. Our final product is Infray’s mini LED flashlight that boasts a strong beam despite its compact size. For those working in maintenance, medical or similar sectors this light is a great addition to your everyday tools that will make life a little bit easier. The light has the ability to be focused on different situations and comes with a decent run time using easy-to-find AAA batteries. The aluminum body can take quite the beating, which is ideal for those who find themselves in tough environments day after day. Quality - The quality of the construction is what sets apart the best products from the worst. They might look similar, they might weight the same, but a low quality product is not going to provide the same results as one designed with higher standards. This quality can consist of the type of material used, the battery required and the strength of the beam. These were all factors we considered when separating great pen lights from simply okay pen lights. Brand - The brand is an important way to gauge how reliable and respectable the pen light will be. There are tons of different types of pen lights out there, but with sufficient research we were able to identify the best brands that delivered the best results every time. Sometimes though, brands will continue to get by on reputation, despite putting out inferior products. Again, this is something we looked into to make sure that we found only the best pen lights. Reviews - People who have bought and used the product are the best way of determining how good the pen light is. These are customers who know their stuff, have utilized the product in the exact situations that they are intended for, and have hopefully owned them long enough to figure out all the pros and cons that make them an authority on how good the pen light is. We could just take the manufacturer’s word for it, but that wouldn’t be fair to you, would it? Price - We’ve tried to find an acceptable price range that means that anyone who reads our lists and is inspired to purchase a pen light can do so. To make it easier, we’ve identified 5 of the best and brightest pen lights that we believe stand out above the rest and offer a decent scale of affordability. If you are planning on buying a brand new penlight or adding one to your collection, then be sure to consider the following features that make only the best penlights stand out from the rest. Convenience - Penlights are supposed to be easy to use and simple to carry. Depending on your needs, you want something that is both convenient and effective. Unlike larger flashlights, the pen light is should be easily sorted in a pocket or backpack, or clip onto your belt and can be grabbed and used in a flash (light, hahaha, sorry). What you need to consider is whether the penlight is convenient to carry around with you and not feel too cumbersome or weighty when attached to a pocket or backpack and whether it will provide adequate light when you need it the most. Material - The kind of material that is used is another thing to consider. Typically, you will be using this light when camping, during checks and maintenance activities or even for work, if you are a medical military or law enforcement professional. These activities require the product to be robust and durable, able to last years of use without suffering scratching or external damage that could affect its operation. You also need to look at thow waterproof the pen light is. We’ve tried to identify pen lights that are water resistant in some way, but there are levels of waterproofness. Some will be resistant up to just one meter for 30 minutes, which will normally be enough time to retrieve the pen light should it be dropped or knocked off, while others can withstand as much as two meters of submersion. Ease-of-Use - The design of the pen light itself is a crucial feature to consider. This means having buttons that are easy to press and is not too large to be carried with ease. In certain situations, the ease-of-use of your penlight could mean the difference between survival and injury (or worse), and so having been able to operate it quickly will make a world of difference. Runtime - The last thing you want to happen is to have the battery run out when you need it most. Pen lights offer a wide range of runtime, but this all depends on the Lumen level. Some lights will only work for up to 30 minutes on the highest setting. However, when used on the lowest setting, this time can be as much as 9 hours or even more with certain products. It all depends on what you need your pen light for. If you want something to help you to identify hard to see areas at work, then it doesn’t really matter if the runtime is only 30 minutes on high, as you will not be using it for that long. If you need it when camping, though, you will need to find something with a longer runtime on its highest settings so that you can rely on it in the depths of the woods during the darkest nights of the year. Durability - Durability has a lot to do with the type of material used, and you want to ensure that your pen light will last a lifetime through all sorts of knocks, scrapes, and drops. Many of these penlights use aerograde casings, which keep it safe through years of use. Furthermore, some will be designed to prevent rolling when placed flat on a surface. This keeps it even safer, as you do not need to worry about losing the penlight down gaps, drains, or other places. Durability - The type of battery will depend on the runtime, reliability, and brightness of the penlight. Some batteries are harder to come by than others, so it is a good idea to check that you can easily get hold of these batteries when the ones provided run out. It is always important to have a decent backup supply of batteries to take with you and replace in your penlight if the existing batteries run out while you are using them. 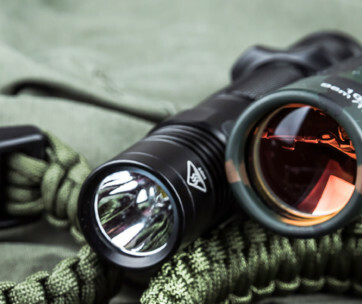 The differences between a penlight and a tactical flashlight are minimal and really, the major focus should be on the difference between these two products and a regular flashlight. 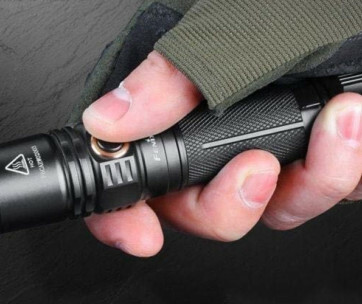 Both pen lights and tactical flashlight constructed much better than the traditional flashlight, which make them more durable and more reliable in any kind of situation. But, when it comes to the difference between a pen light and a tactical flashlight the main contract is the purpose. Tactical flashlights are used in military operations and self-defense scenarios, whereas penlights are a much more casual, everyday light. There is a bit of overlap, which you will have seen on this list, and really, there is little difference between the two, with both types having their advantages depending on your situation. If you need a reliable light source in your home, then a pen light or tactical flashlight should be considered above the cheap products you can find in any dollar store. Q: What is a Penlight? A: A pen light is a pocket LED flashlight that looks more like a pen than something you would use to light the way. They are lightweight, compact, and easy to carry around, while still being an excellent light source for all kinds of situations. They are great to use at work, while camping, and for general self-defense that can be stored with ease without getting in the way or weighing you down. Q: Why Should You Carry a Penlight? A: Due to their small size, especially compared to powerful flashlights, pen lights are excellent to carry around with you, even if you rarely need to use them. They are helpful to have in any situation that you might find yourself unexpectedly in the dark, and can be used to help you see things more clearly where there is no light source, such as trying to fix the back of the TV, or searching through your backpack for something important, without having to remove anything. They are also excellent tools to use when camping, hunting, or at work, especially if you are a medical professional. They do not take up much room at all, and can be easily accessed from your pants pocket, shirt pocket, backpack or belt clip so they can be used quickly whenever they are needed. Even if you do not go camping, or have no reason for using a penlight at work, they are still a useful purchase to have on your person or around the house, just in case. You never know when it will come in handy. Most people would not think to carry around a flashlight with them, believing that it is unnecessary to carry one with them, and would often not have room. However, there is always the chance of finding yourself in a situation where you need a light source. Most of us would use our smartphones, but having a penlight will help you save your phone battery as well as lighting the way, even if you are just walking down a dark alley where the streetlamp still hasn’t been fixed. Q: What kinds of batteries are required for these units? A: An LED pen light or one with a small bulb typically requires AA or AAA batteries, although there are some which can use AAAA batteries, which are thinner than more common models. Typically, you will need to put between 2 and 4 batteries in the pen light, and the brightest pen light will more than likely either require stronger or a greater number of batteries to operate to its full potential. For even greater convenience, you might even find a rechargeable penlight, which will save you heaps of dough on batteries in the long run, and means that you can always rely on your penlight to be easily operational, but maybe take a couple of spare batteries with you, just in case.